DiskGenius offers safe and easy HDD data recovery solution. Whether you want to recover deleted files or recover formatted/damaged files, this software is a reliable option. How to recover hard disk drive? Yes, you can send your hard disk drive to a local disk repair store, but this is expensive and not safe. So, more and more people want to find DIY HDD (Hard Disk Drive) data recovery tool to recover lost data from hard disk drive. There are many HDD data recovery tools on the market including disk repair software and data recovery software. In this article, we will introduce a comprehensive and easy-to-use HDD data recovery tool to help you recover lost data from hard disk drive. Nobody wants to complex HDD data recovery tool. Most of users like you want to easy-to-use and powerful HDD data recovery tool when they lose important data on hard disk. DiskGenius is such HDD data recovery tool which combines ease of use and powerful data recovery features. Recover hard disk drive when the data is deleted, formatted. Recover lost data from damaged, crashed, or inaccessible hard disk. Recover lost hard disk drive partition. Support to recover all types of lost files such as photos, videos, documents, audio files, etc. Preview before recovery of lost data. This HDD data recovery tool not only can recover lost data from HDD, but it also can easily recover lost data from SSD, USB flash drive, memory card, digital camera, external hard drive, MP3/MP4 player, RAID, Server system, etc. It offers deep scan mode to ensure finding every recoverable file on the hard drive or storage media device. As said above, DiskGenius is powerful and easy-to-use. It means you and other common users can easily recover hard disk with this HDD data recovery tool. After installing it on your computer, just run it to recover your lost data from hard disk within 3 simple steps. Step 1 Choose the hard disk drive to start data recovery. 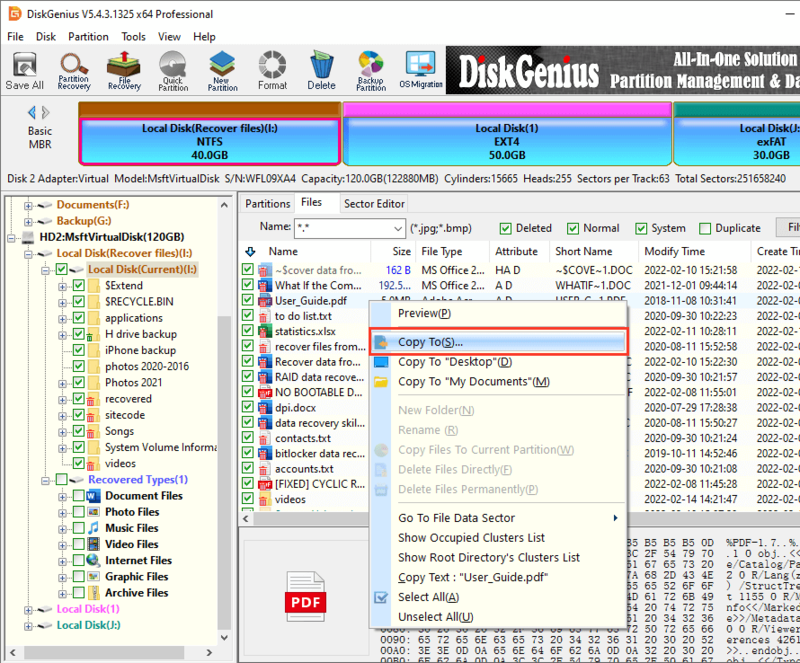 After running DiskGenius on your computer, it will show all hard disk drives on your computer, just select the hard disk where your data is lost to start data recovery. Step 2 Scan the hard disk drive to find lost data. After selecting the hard disk drive, just click "File Recovery" to scan the hard disk drive. DiskGenius will deeply scan the selected hard drive and find the data you've lost. Step 3 Preview and recover lost data from hard disk. When the scan is completed, you can preview the found files. Then select and save the files you've lost.